Extra 15% off new year countdown. 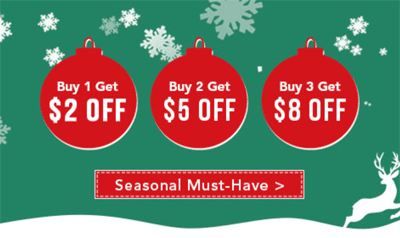 $15 off $99+,$8 off $59+,$5 off $39+. Up to 70% off 2018 stunning christmas. $25 off $169+,$12 off $99+,$6 off $59+. $20 Off $199+, $15 off $159+, $10 off $99+,$60 Off $69+,$3 Off $39+. Hug clearance sale start from $0.99.